Bed bugs might be small – adults are only 5.5mm long and 3mm wide – but they are a big problem. And it’s getting worse, as the hot summers we have recently been enjoying help to shorten the insect’s reproductive cycle, so there are more of them around. The UK’s bed bug population is believed to have been increasing every year for more than a decade. Essex and Suffolk Pest Solutions supply effective bed bug treatments to homes and businesses in Clacton, Colchester, Ipswich, Stowmarket and across both counties. And don’t worry about any social stigma attached to having to call us if you have had an infestation of bed bugs, as our vans are unmarked, so no one else needs to know that you have a problem. Bedbugs usually come out to feed at night. Their preferred diet is human blood, but they have been known to feed on pets such as cats and dogs too. They do not carry any diseases, but if you have been bitten, your skin will itch. If you scratch the bitten area too much, you run the risk of a secondary infection. In the worst cases, anaemia can result. Bed bugs were common in the UK, but they were almost wiped out when the chemical pesticide DDT was used to combat them. However, DDT was banned in the UK in the 1980s because of the damage it was doing to other wildlife and the environment, and bed bugs have been on the increase since then. Increased foreign travel has helped this pest spread all over the world. How Do They Travel from Home to Home? Among the biggest ways bed bugs travel is in mattresses or chairs, so be wary of buying any second-hand furniture. They can also be transported on clothes and in bags and suitcases, which explains why they have been found in hotels, cruise ships and overnight sleepers. 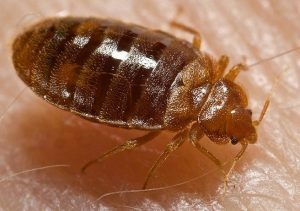 Dr Stephen Kells, from the University of Minnesota, noted at a PestWorld conference in the USA that certain items used by people proved attractive to bed bugs. Items which had had at least eight hours of human contact, such as shoes and the armpits of clothing, encouraged the bed bugs to move towards them and hide. This raises the possibility of them hitching a ride to form new colonies elsewhere – maybe a part of the reason for their rapid spread. How Do You Keep Them Out? If you are looking for some furniture, go new rather than second-hand. You should also try to avoid leaving your unworn or dirty clothes strewn across your bedroom. Put them away in a laundry basket, or better still, place them in sealed bags. Regular vacuuming of the carpets will also help. When you are staying in a hotel, carefully inspect the room and beds for signs of these pests before unpacking. You should check your mattresses, chairs and cushions as bed bugs like to hide in or near the bed, and possibly in or near a chair. Your curtains and carpets may also be harbouring these pests. As well as looking for the bed bugs, watch out for some little brown specks, which are their droppings. Eradication can prove difficult, and a combination of spray insecticides and steam may be necessary to get the highest success rate. Carpets need to be deep vacuumed, any infested furniture dismantled, and any clothing and bedding washed at a temperature of at least 60C. At Essex and Suffolk Solutions we usually apply three treatments at two-week intervals to ensure they have been fully eradicated. We can provide speedy, effective bed bug treatment in Clacton, Chelmsford, Manningtree, Felixstowe, Woodbridge, and across Essex and Suffolk. Follow the link above to get in touch. ‹ Do You Have a Mouse in Your House?